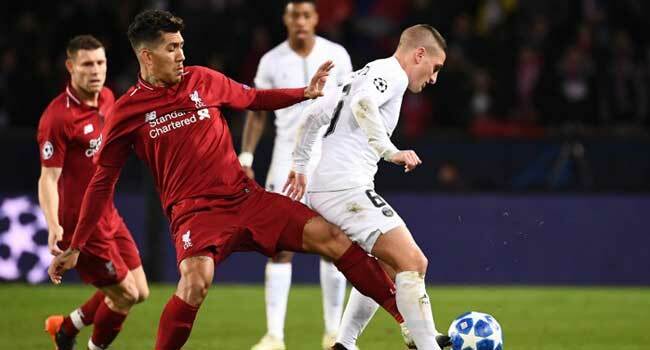 Liverpool’s Brazilian forward Roberto Firmino (L) vies for the ball with Paris Saint-Germain’s Italian midfielder Marco Verratti during the UEFA Champions League Group C football match between Paris Saint-Germain (PSG) and Liverpool FC at the Parc des Princes stadium, in Paris, on November 28, 2018. Roberto Firmino came off the bench to score with his first touch as Liverpool came from behind to maintain their unbeaten Premier League start on Wednesday after Jurgen Klopp’s decision to ring the changes almost backfired. Two goals in the space of seven minutes midway through the second-half sealed a hard-fought 3-1 win at struggling Burnley after Jack Cork’s 54th-minute effort had given the hosts an unexpected lead against a side they’ve now beaten just once in the last 12 attempts spanning 44 years. It means Liverpool remain second, cutting Manchester City’s advantage at the summit to two points with a 12th victory of the campaign, and in the process posting the club’s best start to a top-flight season after 15 games. Liverpool’s German head coach utilised his squad to make seven changes from the side that clinched a dramatic stoppage-time Merseyside derby victory over Everton. The hosts had the ball in the net as half-time approached, but Ashley Barnes’ fine first-time 18-yard volley into the top corner from Robbie Brady’s free-kick was correctly ruled offside. Burnley’s former England keeper further excelled when he managed to fingertip a fierce Naby Keita effort onto a post and out for a corner after the Liverpool midfielder burst past Ashley Westwood. The hosts responded with their best spell of the game as the hour mark approached, and a 300th league game in management for Burnley’s Sean Dyche’s looked like being a fruitful one after Cork pounced for his third goal of the season. That was until Milner’s leveller changed the complexion of the game, and Klopp quickly called on his cavalry to provide the desired result. Alisson redeemed himself in stoppage time with a great save from Mee’s header before launching the move that led to Liverpool’s third goal when Xherdan Shaqiri swept home a Salah-inspired move to leave the Clarets only off the bottom only on goal difference after taking two points from the last possible 24.